At the junction of Brick Lane and Bethnal Green Road during the summer the Socialist Workers Party organised regular Saturday Anti Nazi League demonstrations against the National Front. Who in turn each Sunday held their meetings and distributed their newspapers from the same place. 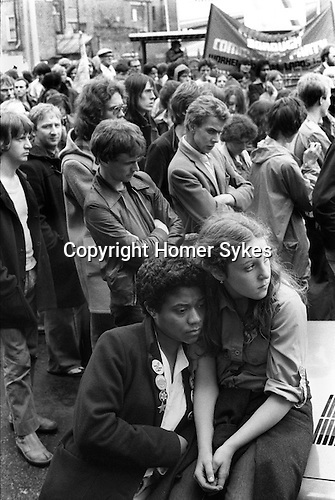 A despondent young woman leans against her friend, she proudly wears pin button badges proclaiming, ”Gays Against the Nazis”, “Right to Work”, “Anti Nazi League”, “Skateboard Against Racism”, and the Star of David.